No need to worry about dust mites and allergies when you sleep with a hypoallergenic goose down comforter. Unless you are of the rare few who are allergic to actual feathers, goose down comforters are an excellent way to pamper yourself and keep your bed dust & mite free. The filling and fabric used in the popular La Crosse Down Comforter actually provides extra protection. Feathers are not very inviting to mites. They offer poor shelter because feathers and down are breathable and will wick away any perspiration. Plus the meals just aren't up to mites standards because mites do not feed on feathers. 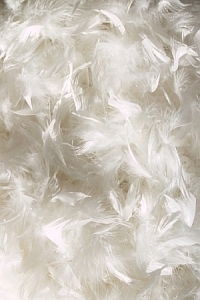 Down and feathers passing industry labeling standards are hypoallergenic on their own. Goose down cleaning process is to the point of sterilization and testing is required for approval. Never buy any bedding product that does not have a label. You would have no way of knowing if you are getting goose down or chicken feathers. The finest hypoallergenic goose down comforters are covered in natural, breathable fabrics such as cotton. The fabric acts as a barrier to protect against dust mites and prevents feather loss. The higher the thread count the more protection the fabric will offer and it will feel softer to the touch. A thread count of 360 or more is considered premium quality. A high thread count of 680 will make a cotton feel silky soft! Different manufacturers have their own “specialty weave” for extra protection and strength. Don't let your gorgeous, and expensive hypoallergenic comforter go to waist buy leaving it unprotected against body dander & oils, accidents & spills, or dust mites. Plan to purchase your bedding protector at the same time as the down comforter/duvet that way you'll rest assured that you have the cleanest possible bedding for your family. Return from this Hypoallergenic Goose Down Comforter page to the Down Bedding Delights home page.